For most of us, the word ‘interview‘ sends a shudder down our spine. No matter how many interviews you have appeared for, chances are that you will always have butterflies in your stomach. Being a little nervous is a good thing, especially since it brings out the best in you, yet you should ensure that you do not let this fear get the better of you. 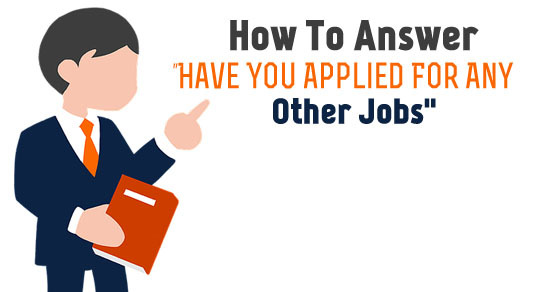 In the event of being asked the question, “are you applying for other jobs?”, here are the ways in which you should go about answering it smartly. When you appear for an interview, it is important that you prepare adequately such that you do not end up making a mess of things, once you are seated before the recruiter of the company. Jobs are scarce so you must ensure that you bring your A game and if possible you should be sure to prepare answers to some tricky questions which you know are bound to be asked. ‘Are you applying for other jobs?’ is a question which many recruiters love asking to throw their interviewees off guard. So ensure that you think about what you will say. When you are asked this question it is vital that you do not blurt out any answer which comes to your mind. It is vital that you think a little and then proceeds with whatever you would like to say. Even the smallest of mistakes while answering might cost you a great deal in the long run. So be sure to choose your words wisely. The interview phase of a job selection is very important indeed and it is the main factor in determining whether or not you will be able to bag the job, so ensure that because of one question you do not let this opportunity slip through your fingers. When asked this question, you must ensure that you put your thinking cap on in order to give a satisfactory answer. One of the worst things to do when in this position is lie and say that you either have or have not applied to any other companies. If you get away with this lie, then good for you. But what you ought to remember is that all top companies get close tabs on each other and if from any source they find out that you have been telling lies, then this is not going to go down well with them and they are immediately going to eliminate you from the running. If you are a person who believes that less is more, then rather than saying too much you can simply answer the question with a yes or a no, based on whether you have applied or not. If you have a stern stance and answer in a polite manner, then chances are that the recruiter will not prod you anymore as he or she would know that if you wanted to say anything more you would have. As mentioned above it is important that you utter the words in a very respectable manner, because if you come across as rude, then you will no longer be considered for the job. If you wish to make it big and be successful in business world, then it is vital that you act in a professional manner at all points in time. If you have applied for other jobs in various other companies, then you simply state that you have. No matter what your answer is, you must ensure that you speak in a professional manner. Most often, recruiters simply ask tricky questions , not because they want to know the answers or that they are curious, they simply want to gauge how you speak and whether you can handle a tricky situation with ease. One of the worst ways to go about answering this question is by showing on your face that you are feeling guilty about applying to other jobs. If your countenance reflects fear and shame then this is something which is going to create a very bad impression in the mind of the recruiter. There is no shame in applying for jobs in other companies as well and that is why you need not feel awkward. Everyone knows that jobs are few and anything can happen, that is why many people prefer to apply for a number of jobs. Be unapologetic in your manner. As mentioned above, some people might not have what it takes to answer convincingly and politely in merely a monosyllable, so if you are one such person, then maybe you can divulge some details about where you have applied. Yet, ensure that you do not go overboard and divulge all too many details, which no one is really interested in knowing. What you should understand is that recruiters are very busy people indeed and they do not like to listen to long drawn out answers as that just irritates them. If this is a question which for some reason or the other, you would like to avoid answering then you can choose to be a little vague. If you are blessed with a good and polite recruiter then chances are that he will understand that this is a question which you are not willing to answer then he will move on to the next question. Irrespective of whatever question is asked to you in the course of your interview, you must ensure that you give a proper answer. If you are asked the question, stated above then all you need to do is answer to the best of your ability. Walk in for your interview with a very clear head and ensure that you do not let anything bring you down. The moment you start stammering, that is when you will create a bad impression in the mind of your recruiter. So know where all you have applied to and if needs be prepared to, mention the names of the companies when asked to do so. In the event of having sent your resume to other companies in order to apply for a job, then during the interview, you ought to say that even though you have sent your resume to a number of companies, it is this job which you would like to bag the most. You should make it a point to not come across as desperate, yet still, mention that this seems like a dream job to you and you would be delighted to represent the company. State that you know that this job will be a great opportunity for you. Your enthusiasm and passion must shine forth through the words you utter and answers you give during the interview. Prior to giving any answer, it is vital that you evaluate the pros and cons of whatever answer you are choosing to give. When being asked this question, if you blindly say yes you have, then chances are that the recruiter is going to think that you are someone who is not sure about what you want. In addition to this he might even think that you have no belief and confidence in yourself and that is why you have applied any and everywhere. Through your answer ensure that you state that this is not the case with you. There are some complications involved with saying ‘No I have not as well’. If you say that you have not applied to any other jobs, contrary to thinking that you are someone who has self-confidence your boss might think that you are someone who is smug and too sure of yourself. In addition to that, he might even think that you are lazy and not willing to work towards what you want to achieve in life. At no cost would a company like to hire someone who is lazy and will not take matters into his own hands. It is important to note that this is just one of the questions which recruiters ask and it is unlikely that your answer to this question will either make or break your interview. There are plenty of other more challenging questions which are going to be asked in the course of your interview, so ensure that you are concentrating more on that. One of the best things to do when asked this question is to treat it as any other question which is thrown to you. As mentioned above you should not fret at any cost. You should remember that such a question does not reflect you personality or even your job skills in any way and your recruiter is possibly simply asking it for the sake of formality or as an ice breaker. If your recruiter stresses on something as unimportant as this then he probably has no experience and does not know what he is doing. If you have applied for other jobs, then while saying ‘Yes I have’, rather confidently you should ensure that you mention that the jobs which you have applied for are rather similar to the post which you are presently interviewing for. If you state this, then the recruiter will get an idea that you have applied for all similar posts in the top companies and not submitted your resume to any and every company just to be sure. If you are a rather practical person, then you can consider saying that you have applied for other jobs, simply because you are well aware of the fact that given the present global economic conditions companies are not hiring many people. It is for this very reason that you have decided to send your résumé out to a number of companies, as your policy is that it is better to be safe rather than sorry. When you give an answer like this your recruiter will know that you are someone who has your feet firmly planted on the ground. Finally rather than seeking advice from any and everyone, ensure that you just follow your heart and say whatever comes naturally to you on the day of the interview, when seated in front of the interviewer. These are some of the best ways on how to answer this question if it is asked to you. There is no point fretting or over thinking your answers, simply give your best by trying to come up with good and direct answers on the spot. Nowadays even bagging a chance to give an interview is tough, so you must ensure that you make the most of the opportunity which has been given to you rather than feeling nervous or inadequate. On that note, good luck.